The American Electric Power coal burning plant in Conesville, Ohio, on Nov. 10, 2011. One key piece of the Obama administration’s latest proposal for reducing carbon emissions from power plants, announced on Monday, would have states start or join existing regional cap-and-trade programs. While the success of cap and trade in cutting power-plant emissions that cause acid rain is widely known, using the same approach to regulate carbon dioxide emissions has a shorter, and bumpier, track record. Since 2009, nine northeastern U.S. states have operated a cap-and-trade market for power plant carbon dioxide emissions, and my analysis indicates that this market had a minimal effect on emissions. Why? 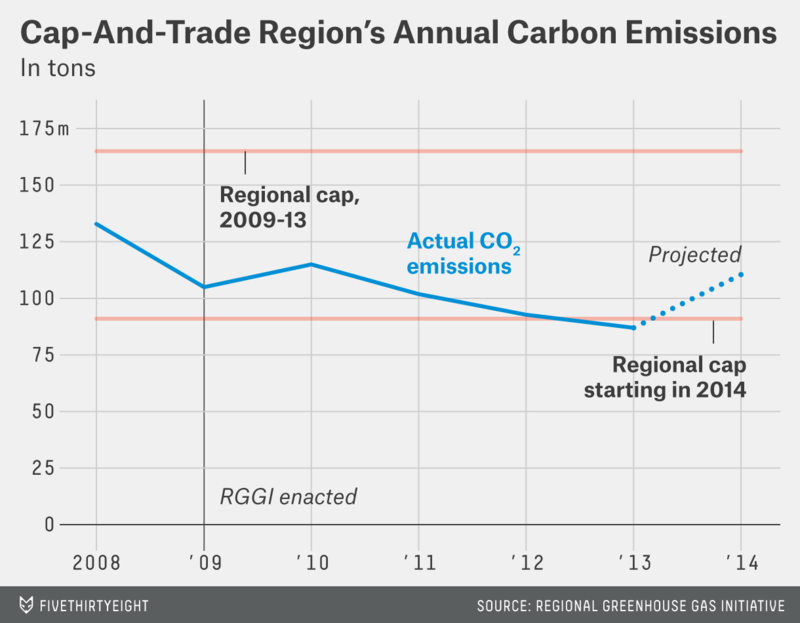 The “cap” part of cap and trade was, until recently, too high for the program be effective. Known as the Regional Greenhouse Gas Initiative (RGGI), the program was designed and agreed upon by Connecticut, Delaware, Maine, Maryland, Massachusetts, New Hampshire, New Jersey, New York, Rhode Island and Vermont in 2005. (New Jersey Gov. Chris Christie pulled his state out of the program in 2011.) The RGGI set a cap on carbon dioxide emissions for the entire region, and specific allowances for each state, that were based upon actual emissions amounts in the early 2000s. In its original design, the program set a fixed cap for 2009 through 2014, with decreases in the cap of 2.5 percent per year scheduled to begin in 2015. The basic concept of cap and trade is simple: The government sets an overall “cap” on the quantity of a particular compound that can be emitted into the atmosphere. Entities like power plants then purchase permits, known as “allowances,” in order to legally release that compound. The allowances are traded among entities on an open market, so that companies must purchase permits to pollute, giving them a financial incentive to invest in cleaner technologies that reduce their emissions. In most cap-and-trade schemes, the overall cap on the total emissions gets lower over time, with a corresponding increase in the market price of allowances. To assess the effectiveness of the northeastern states’ program at reducing carbon dioxide emissions, I compared emissions data from the nine RGGI states with similar data from all the other states, which had no regulations on carbon dioxide emissions.1 If the rate of change in carbon dioxide emissions in RGGI states differed from non-RGGI states, that would be a good initial indication that the RGGI program was working. The chart above shows that carbon dioxide emissions have declined considerably during recent years in both RGGI and non-RGGI states. This nationwide pattern cannot be attributed to a regional program like the RGGI. Instead, it results from two major factors: the recession, which hit hardest in 2009 just as the RGGI program began, and increasingly abundant natural gas, which emits less carbon dioxide than coal. If you compare the two lines from 2009 to 2012, it’s not clear whether the RGGI states have been lowering their carbon emissions any faster than the rest of the country. It’s possible that the large initial decline from 2008 to 2009 in RGGI states, corresponding with the start of the RGGI market, was in part driven by the program, but it’s a stretch to make that conclusion from this data alone. We can look more closely, and perform a statistical test, by using data from individual states. Here, each line represents a different state, and the carbon emissions of each state are normalized to their 2008 values. 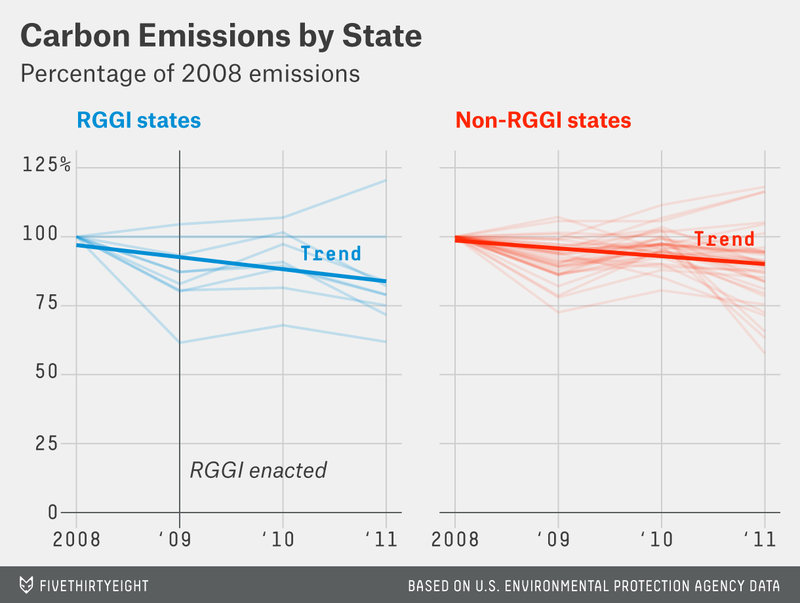 There are two charts: one for RGGI states and the other for non-RGGI states, each with an overall trend. 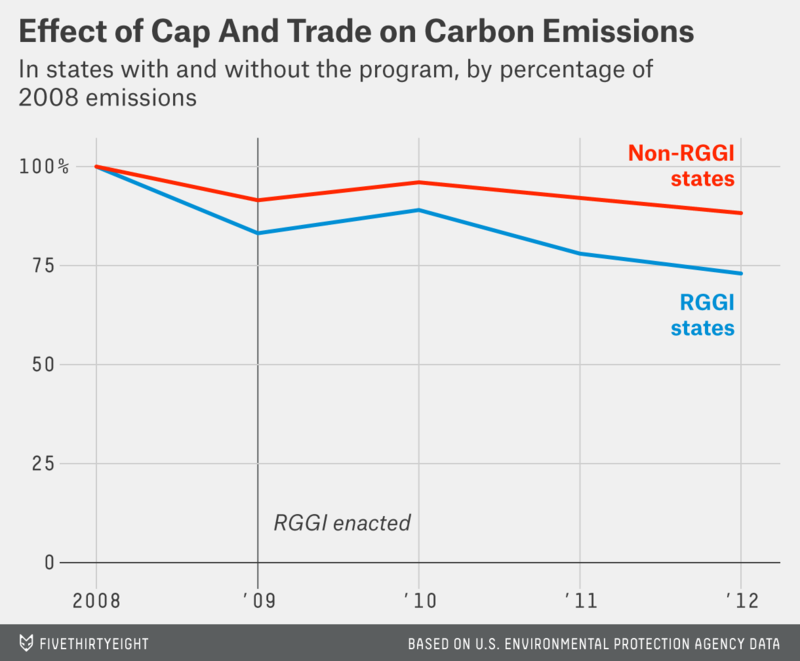 Both show a decrease in carbon dioxide emissions over time, but there is no statistically significant difference between RGGI and non-RGGI states in the rate of decrease.2 Again, there is no evidence that the nine northeastern states, under a cap-and-trade program, saw their carbon emissions decline any faster than the rest of the country did. The RGGI program, the first regulation of carbon dioxide emissions from power plants in U.S. history, had little initial effect because the cap turned out to be much too high. The cap amount was set in 2005, and was based upon actual emissions amounts during the early 2000s. The assumption was that without regulation carbon dioxide emissions would continue to rise and should therefore be capped and held at their current levels. Instead, carbon dioxide emissions decreased considerably due to the recession and the natural gas boom, but the RGGI program wasn’t flexible enough for the cap to move along with them. In its first five years, the RGGI’s market-based cap-and-trade program gave power plants no incentive to reduce their emissions because the cap amount simply was irrelevant. As you can see, the first sales of allowances, in late 2008, put the price of carbon dioxide emissions at around $3 a ton. Under a cap-and-trade program that’s working as intended, the price of allowances should increase over time, giving power plants an incentive to reduce emissions. In the case of the RGGI, however, the price plummeted in mid-2009 to around $2 a ton, and for most of 2010 through 2012 it remained below $2. It likely would have stayed at that price but for the dramatically lower cap starting in 2014, which will decline by 2.5 percent each year until 2020. 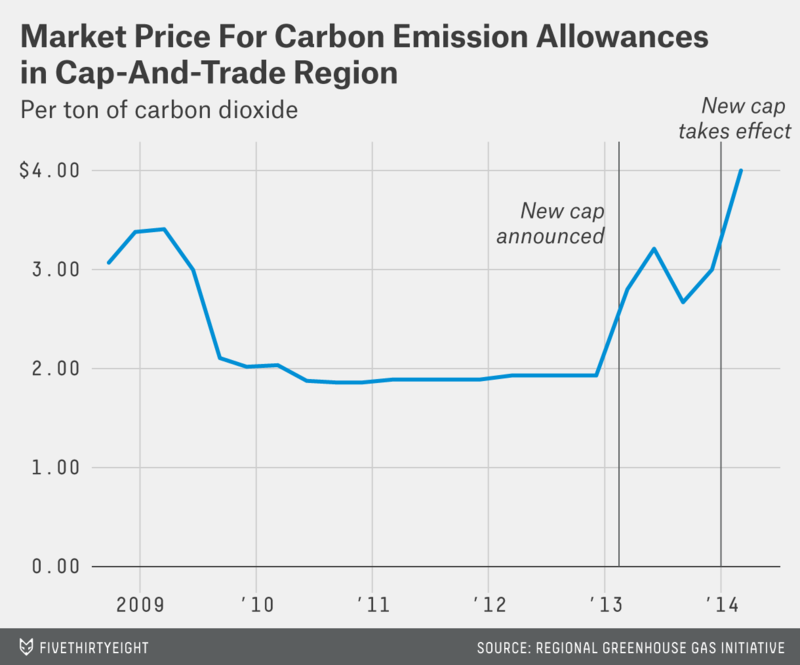 After that cap was announced, the market price of carbon allowances promptly began increasing; the regional cap was suddenly relevant. We can take some lessons from the RGGI and apply them to the new federal program to regulate carbon emissions, which includes giving states the option of creating new cap-and-trade programs. The system must be able to adapt to unforeseen conditions. The RGGI’s big flaw was that there was no mechanism in place to lower the cap if something unexpected happened with energy markets. The Obama administration’s new program has one huge advantage over the RGGI in this regard: Because it’s a federal program, it should in principle be more adaptable, since it’s being imposed from the top. The RGGI is a regulatory agreement among nine states, so any changes to the agreement have to be negotiated among nine different governor’s offices, state legislatures and other relevant entities. On some level, it’s no wonder it took the states four years to pull off lowering the cap. An optimistic observer would hope that the U.S. Environmental Protection Agency, which will administer the new carbon emissions rule, will be in a better position to adjust its new program in response to unforeseen conditions than the RGGI initially was. Although the proposed rule will give states a number of different options to choose from in order to meet required emissions reductions, the standards themselves — the caps — will be determined by the EPA. California is the only non-RGGI state that now also regulates carbon dioxide emissions from power plants, but its cap-and-trade program didn’t begin until 2013. I fit linear mixed-effects models, via maximum likelihood, to the full data set of all states, with state as a random effect. I fit a model with “Year” as a continuous fixed effect and RGGI/non-RGGI as a binary fixed effect. I tested this model against a null model in which only the fixed effect of Year was present. I tested the RGGI/non-RGGI model against the null with a likelihood ratio test, which resulted in a p-value of 0.09. I also tested a model that additionally included an interaction term between RGGI/non-RGGI and Year; the likelihood ratio test for this model against the null resulted in a p-value of 0.12. The point shown in the chart for 2014 is based upon reported emissions for the first quarter of 2014, extrapolated to a full year of emissions at that level.